In 2016 Lime Pickle launched the world’s hottest curry. All the ingredients for this curry have been flown in from Bangladesh, Mexico and Jamaica! You also have to sign a health disclaimer before you take part. The curry is so hot that our chef has to wear a gas mask while cooking. This curry cannot be purchased over the counter. 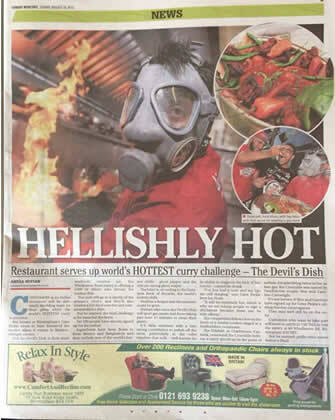 If you would like to try and complete The Devil’s Dish then please contact us. If you can complete this curry within 15 minutes you will be rewarded with £100.00 to your chosen charity, £25.00 food voucher to spent at Lime Pickle, T shirt and be on the Lime Pickle hall of fame. This challenge it not for the faint hearted!